Paint interesting patterns or place stamps on the page using the Brush Tool. Photoshop has many brush styles that allow you to be creative. 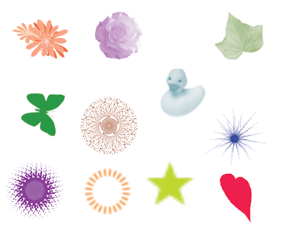 Assorted brushes, DP brushes, Special Effect brushes, or M brushes are just a few options that allow you to make flowers, stars, hearts, butterflies, and more! For each brush, you can adjust the size and hardness to make the paint look exactly the way you want. Try it! Make Stamps with the Brush Tool. 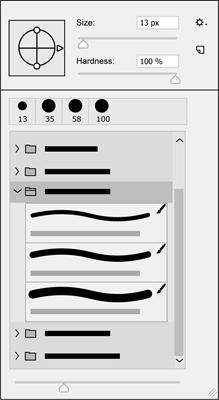 Click the Brush Tool from the Tools panel. Click the Brush Preset picker on the Options Bar. Brush options are displayed. Select the Select the Special Effect Brushes folder. Pick the Special Effects Brushes folder. 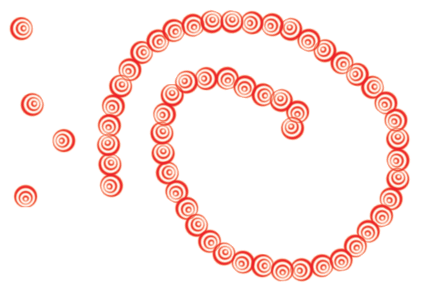 There are many fun styles in the Special Effect Brushes. Select an option from the list. Change the Size to 100 px. Change the Hardness to 100%. Select a paint color; click the Set foreground color swatch. From the Color Picker dialog box, make a selection from the color spectrum. Click OK.
Click and drag the mouse to apply brush strokes OR click only once to place stamps on the page. Click once to make a stamp. Click and drag to create a unique pattern. Click the Eraser Tool from the Tools panel. Select Eraser options from the Options Bar. To erase a large area from the Mode option select Block. To erase a smaller area from the Mode option, select Brush and use the Brush Preset picker to customize the style of the eraser. To erase an area, click and drag the mouse over the unwanted brush strokes. Select the Rectangular Marquee Tool from the Tools panel. Click and drag around the section you do not want. Press the DELETE key on the keyboard. Do you want more ideas for using Photoshop? TechnoPhotoshop has many fun activities ideal for middle and high school students that are new to using Photoshop CC.